Here is Corrie Ten Boom’s famous flea story from The Hiding Place. We lay back, struggling against the nausea that swept over us from the reeking straw. ..Suddenly I sat up, striking my head on the cross-slats above. Something had pinched my leg. “At first Betsie and I called these meetings with great timidity. But as night after night went by and no guard ever came near us, we grew bolder. So many now wanted to join us that we held a second service after evening roll call. There on the Lagerstrasse we were under rigid surveillance, guards in their warm wool capes marching constantly up and down. It was the same in the center room of the barracks: half a dozen guards or camp police always present. Yet in the large dormitory room there was almost no supervision at all. We did not understand it. More and more, I have been struck by how the very worst thing that happens in people’s lives sort of morphs into the very best thing. Yes, it makes sense to live in gratitude, praising the Lord anyway. 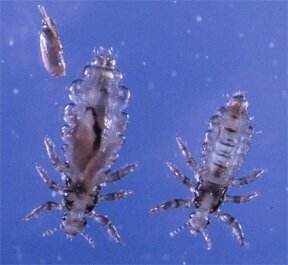 We don’t have a flea story, but we do have a lice story. When one of my daughters got into a selective private school in Oxford when she was 5. She was a chess and math prodigy, with a whole lot of chess prizes, so was selected by a very ambitious mother as a suitable friend for her hot-housed only child I’ll call Amelie. So “lice letters” went home regularly, and every time, this other mother, an ambitious South African who came here, married her professor, breaking up his marriage, phoned or emailed me, telling me of the 45 minute trauma she went through delousing Amelie, and insisting I did the same. The two girls were best friends, and genuinely fond of each other, but Amelie, who was a little politician was always grieving my daughter. “No, you sat with me last time, it’s X’s turn. I’ve invited X for a play date. Invited Y for a sleepover. No, you are now not my best friend.” My daughter is the faithful sort who has just a few deep friends, and this was throwing her into turmoil. Finally, I had enough of the lice emails, since I was pretty sure that my daughter was getting them from Amelie, and told the other mother that if Amelie dealt with her lice, the problem would be solved. She was furious, told the teachers that Amelie wasn’t to sit near my daughter, and retaliated by having a party, and inviting the whole class except my daughter (Amelie’s supposed “best friend.”). Yeah, that’s what we are coming too–grownups behaving like children. I have no idea if this is a recent development or was always the case! Well, much heartbreak. But that definitively ended the very competitive and fraught “best friendship” which had caused so much heartbreak, grief and volatility for 3 years. My daughter formed other friends. She is a straight arrow with a warm, loving loyal heart. She’s had the same group of friends for the last 4 years, who are devoted to her and vice-versa, and is now very happy. She loves school, loves her friends, and is excelling academically and is very happy socially. She’s also very popular in her gang of seven girls, in which she a leader. And what’s more, as I suspected, once the mother broke off her friendship with the other girl, she’s never had lice again. We had struggled with it for 3 years, and now, she’s foot-lose, lice-free and happy. It took those pesky little creatures to break off a frenemy relationship which would have marred her school-life. Yeah, praise the Lord even for fleas and lice!! This is unfortunate. I am going through really hard times and was looking for inspiration. I Googled Corrie Ten Boom, already knowing the story. I am really having problems now, and the next line is about your private school in Oxford problems? I can’t even relate and now I feel even worse. Guess I’ll give thanks for it anyway. Thanks, Valerie. Never thought of it that way:-). YOu're right! Anita, thank you for reminding me of the Corrie Ten Boom story. Giving thanks in ALL circumstances is a lesson to be relearnt, although easier said than done. Thanks in brokenness is hard, too. But Corrie Ten Boom shows this so gracefully. Thank you! One of my boys use to attend a school for children with social communication difficulties. I remember talking to one of the other mothers about how we were pleased to find head lice as it was physical proof that they must have been socialising with other kids. So if your children have lice, rejoice, it means they have friends. What an adorable story. I used to be wring my hands and feel like a failure mother. Luckily they are both in high school now, and we haven't had a dreaded lice letter for a couple of years now! !